Just saw Man of Steel, it’s Warner Brothers/DC Comics trying to revive the Superman film franchise again. This time we have Zack Snyder directing with Christopher Nolan at the helm/producer, Henry Cavill as the titular character, Amy Adams as Lois Lane and so on. It’s a Superman movie, Superman does super things against evil and injustice, this case, the already alien looking Michael Shannon as General Zod. The good; unlike comic book movies, a lot of the movie the hero is spent in civilian clothing as his alter ego/normal self. Henry Cavill spends a good ninety percent of the movie in the Superman uniform. That’s what we’ve been missing in these latest superhero movies, not enough of the hero in costume (Iron Man 3, The Dark Knight Rises…). After Superman Returns, we finally get Superman returning to the big screen. 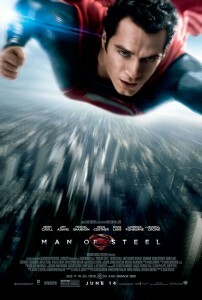 Superman punches, flies and punches while flying, action and explosions galore, why did it take so long to get here?! Henry Cavill as Superman – this guy gets it. Hans Zimmer’s scores are great. The story, without spoilers, is great, it matches to visuals and it just as strong, they compliment each other beautifully. But in all seriousness the action scenes are rather lack luster, it’s nothing new, which is maybe what they’re going for? But I wanted better coverage and choreography in the fight scenes. Too many close ups and shakey cam, it’s something modern cinema suffers too much from. Hans Zimmer’s scores, I know I put this above, but I’m of the school that superheroes should have a catchy theme. We all can hum the John Williams Superman theme, and the Danny Elfman Batman theme, and let’s not forget the Spider-Man cartoon theme or the nana-nana-nana- Batmannnnn theme. So what’s Christian Bale’s Batman theme? “wrrrrrrrooooooooooooommm.” Listen to the themes of today, can you hum them? Overall – go see this movie in the theatre, I really really enjoyed this, and this is coming from me, a die hard Superman fan. When I saw the first trailer I was doubtful, but then that third trailer came out, and I was sold. From the get-go I wanted to be wrong, and I’m glad that I was… Man of Steel delivers in every way possible. This entry was posted in Movies/TV, Reviews and tagged dc comics, Henry Cavill, man of steel film, man of steel film review, man of steel movie review, man of steel review, man of steel; man of steel movie, movie review, superheroes, Superman, superman movie, zack synder on June 10, 2013 by Eugene.